Saitō Toshizo (1534-82) was the lord of Ikuchiyama Castle in Tamba province. He was a vassal of the Akechi clan. 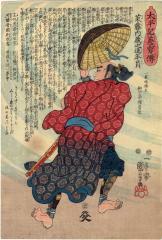 In a struggle against Hideyoshi he was captured behind the enemy lines by Horio Mosuke and then executed. The text on this page is by Ryūkatei Tanekazu (柳下亭種員: 1807-1858).